Have you ever wondered what sort of pixels are arranging the exact picture you see on your phone's screen at the moment? Their color code, coordinates, DIP size of the region you are zooming into? Well, now you can completely geek out with the latest Pixolor app. It lets you zoom on a section of a screen, and reveal to you the exact pixel arrangement that makes the element, down to the individual pixel. You can also preview the color code of said dot, their coordinates, and even the nearest Material Design color to the hue in question. You can share a screenshot of the circular image by long-pressing on the thumb, and, as a tangential benefit, zoom in on hard-to-read very small text on a label or sign in a picture, for instance. 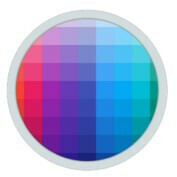 Pixolor is thus a dream come true for developers that have been struggling to grab the HEX codes of various hues all around the interface, which is now as easy as circling the Pixolor wagon on top of the section. Check it out if you are a dev, or simply curious what underlying pixels are behind that cool icon pack you just installed. Again no. You can't measure colors by getting RGB values in software. Let me explain: Any screen will have the same RGB values for a given image on a screen. Yes, an AMOLED or a washed out LCD will have the same RGB values in software for an image. Why? Because the screen technology doesn't dictate the RGB values, the image does. So why do the images look different? Well, the screens map the RGB values provided by the software into their color space by the virtue of factory calibration. A higher gamut screen with a high gamut calibration will map it to a higher color space, producing more saturated images. Hope you get that. Wow...thanks for enlightening me. I have now learned from my mistakes, and thus will not any mistakes again. Youre like a teacher to me. Keepvon dropping knowledge in PA.
Now I can get to witness Sammy's PenTile Matrix! No you won't LOL. PenTile is on hardware level. The pixel level issues by software are standard (R,G,B) for each pixel. This software takes a RAW screenshot and gets the RGB values for a pixel. The RGB to pentile conversion is handled by the display controller. Using a real microscope, yes you will.